How Much Do Egress Windows Cost? Egress windows are a functional aesthetic that is necessary for any modern day building. A good egress window installation must incorporate a complete well and stairway or ladder since most building regulations are converting the egress window into a fire or emergency escape. The cost to install an egress window that is not only big enough to allow you to escape danger but also stout enough to keep the burglars away will vary depending on a number of circumstances. How Much Does It Cost To Install an Egress Window? The egress window installation, in large part, depends on the amount of installation work the contractor will have to do. The cheapest egress windows in easily accessible basements or rooms will cost as little as $300, while most elaborate custom windows could go for as high as $5,400. You could, however, save by installing a prefabricated egress window at an average cost of roughly $2,400. Egress window installation is not your average DIY project. Certain states require you to follow strict building codes. We recommend that you get in touch with contractors in your area, and compare as many quotes as possible. Check for references before you begin any work. This will ensure you pay a fair price for a quality guaranteed job. Escaping from a burning house. Avoiding being trapped in a collapsing house during a calamity, for instance, an earthquake. Escaping from a dangerous assailant or intruder. Though many homeowners will only do egress window installation at their discretion, the International Residential Code (IRC) seeks to make them mandatory. 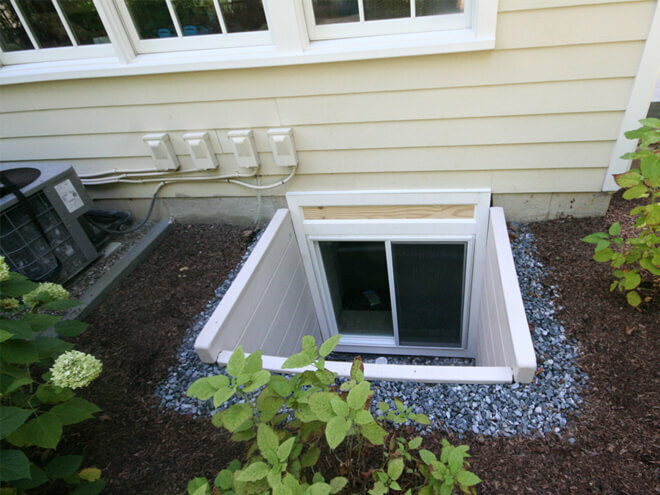 Window wells must have a 36-inch projection and a 9 square foot projection. Any egress windows higher or deeper than 44 inches must have ladders or stairs. Every egress must have a clear area of 5.7 square feet and a maximum height of 44 inches to allow unhindered escape for even the tallest people. What Determines The Cost To Install an Egress Window? The type of egress window is the first cost determinant. If you are looking at a custom egress window installation, the contractor will not only have to spend time creating the opening but also fabricating the egress window itself. The extra labor and hours will affect the cost of the window. Prefabricated windows, on the other hand, are cheaper and faster to install. This keeps the cost low but doesn’t give you the chance to create something unique or highly adapted. Choosing the right egress window installation will make your home safer and more aesthetically pleasing. The installation will also be affordable and you will be at the discretion of choosing the perfect décor to match your home. If you would like to receive a 100% FREE egress window installation quote from a professional in your town or city, simply enter your zip code in the space provided for a customized, no obligations FREE quote!